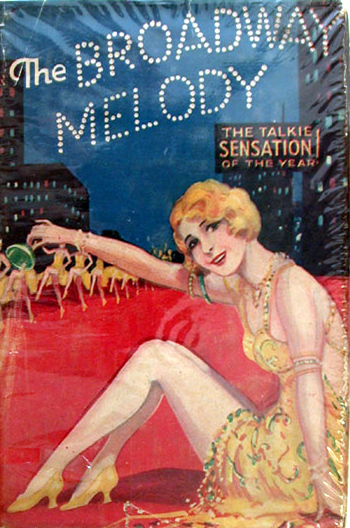 A songwriter (Charlie King) helps his girlfriend (Bessie Love) and her sister (Anita Page) break into show business on Broadway — but King’s sudden declaration of love for Page (which they keep secret from Love) prompts Page into a dangerous dalliance with a sleazy socialite (Kenneth Thomson). This creaky backstage melodrama will forever hold a special place in cinematic history given its status as the first all-talking musical, the first sound film to win a Best Picture Oscar, the first film featuring a sequence (“Wedding of the Painted Doll”) shot to pre-recorded music, and the source of several familiar musical numbers (“You Were Meant for Me”, “You Are My Lucky Star”) given new life in Singin’ in the Rain (1952). Unfortunately, the storyline itself — a tired tale of (somewhat) talentless Broadway hopefuls navigating the lecherous waters of show business — leaves much to be desired; we’ve seen this basic narrative play out far too many times since then. At least the central romantic conflict — in which Page and King suddenly, mutually, and for no apparent reason realize they’re in love/lust with one another, but fear hurting the person they both care deeply about — is provided with some added emotional weight given Love’s spunky performance; and the “big reveal” scene, in which Love learns the truth about her sister and fiance, is appropriately lauded. But the rest of the film shows clear evidence of its age, with relatively static camera work (though to be fair, it’s better than many other “filmed plays” of the era) and several awkwardly handled dramatic moments. Yes, once, but simply for historical reasons. Listed as a film with Historical Importance in the back of Peary’s book. Not must-see…its place in cinema history notwithstanding. Just watched this again (I’d only seen it once before, years ago) – and this has got to be among the most dreary things on film. Even for those interested in the history of musicals or musical comedies (which this isn’t), this snore-fest is wanting. There’s a little bit of music, sure – and, yes, the film introduces a few songs that went on to be popular standards (esp. of the era and for awhile after). But the movie itself is mostly top-heavy with a dumb – and wildly repetitive – love-angle plot that (bizarrely) is often at odds with the actual atmosphere of what goes on backstage during the mounting of a Broadway show. In a desperate attempt to make the film more dramatic, the dialogue is full of tough talk that’s often much more appropriate for a gangster flick than a film about show business. From start to finish, this is mostly a chore to get through. Sheesh.